Dean is passionate about helping his students succeed. He can help you get to where you want to be! If you’re looking for more fulfillment, wealth for retirement, or want to take your personal life to the next level, Dean can help you! Thousands of people all across the country are finding opportunity. They’re out there! And now you have the chance to learn from one of America’s Cash Flow Educators! Although Dean cannot attend the events, his education partner is sending a training team to your area. 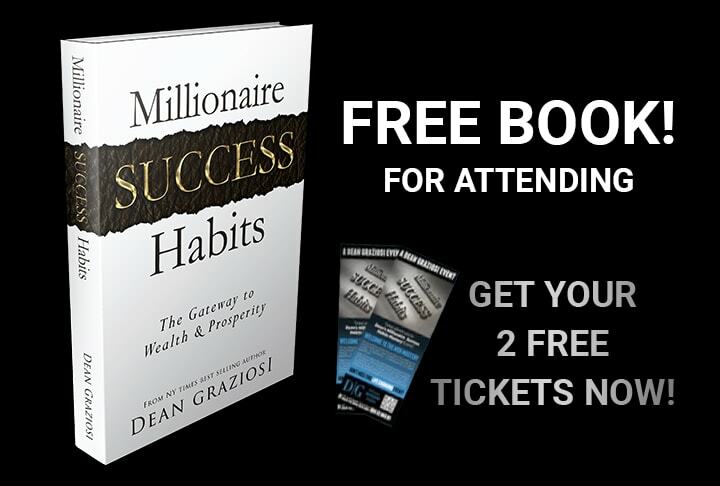 Dean will provide powerful private video instruction at the event to help you discover how his Millionaire Success Habits can change your life! Dean cares about his student’s success! With over 25 years of active experience, Dean brings what he’s learned and helps others to apply it in their own lives. Dean wants others to experience the same success he’s been able to find. He believes that anyone willing to put in the effort can profit in today’s markets! Dean Grazios truly cares about his students. "The best thing about my life after meeting Dean is I have so much more freedom. I have control over my time, I get to spend every single summer with my kid, I've been able to travel a bunch, been able to help out friends and family and have been able to volunteer. Now I have the freedom to do what I want to do and live the life that I want." "By following and learning from him, we’ve gained so much confidence… We have built our business up, we're making very good income. Dean has taught me to change your whole thinking and it changes your life.. If you can change your whole outlook, things do change." "One of the things that's so rewarding now, is that my children look at my in a new way. They look at me with a different admiration and tell me they're proud of me. Being in complete control of your financial life, allows you to discover a better version of yourself." "What I've learned from Dean, I've been able to gain the confidence that I can control my own destiny. I get to spend more time with my family, go on more vacations and travel the world. It's been amazing." "After getting involved with Dean and getting that confidence to go out there and break free and do this on my own, I feel like the ball is totally in my court. I now get to decide what my income is."